Be the first to share your favorite memory, photo or story of Arnold. This memorial page is dedicated for family, friends and future generations to celebrate the life of their loved one. Arnold Ihle, age 85, of Huxley passed away September 11, 2018 at the Madrid Home. Visitation will be Sunday, September 16 from 2 until 4 pm at Bethlehem Lutheran Church in Slater. Funeral services will be 10:30 am Monday, September 17 at Bethlehem Lutheran Church. Burial will be in the Bethlehem Lutheran Church Cemetery. 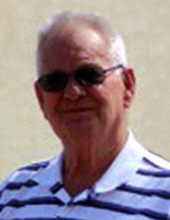 Arnold Stanley Ihle was born on May 11, 1933, the son of Amos J. and Thelma (Larson) Ihle in rural Kelley, Iowa. Arnold was baptized and confirmed at Bethlehem Lutheran Church in Slater. He graduated from Slater High School in 1951. After graduation, Arnold enlisted in the United States Army from 1953 until 1955. He married Juanita (Sue) Arnold on September 4th, 1954 in Vancouver Washington. Arnold started Ihle Construction in 1961 where he specialized in new home construction in the Slater and Huxley communities where he built hundreds of homes for over 34 years. Arnold took great pride in many community events. His life focus was on his family and his love for Christ. He enjoyed their lake home in the summers and playing golf in the winter in Arizona. Arnold was an avid tailgater at the ISU football games, Go State! Arnold is preceded in death by his parents, brothers, Roger and Donald and grandson, Trevor Stewart. He is survived by his wife of 64 years, Juanita (Sue) Ihle; four children, Deborah (Randy) Conard of Ankeny, Bruce (Joanie) Ihle of Ankeny, Gary (Carla) Ihle of Ankeny, Mark (Cinde) Ihle of Gilbert; thirteen grandchildren; 25 great-grandchildren and many nieces and nephew. In lieu of flowers, memorial may be directed to Bethlehem Lutheran Church Stephen Ministry. Online condolences may be left at www.adamssoderstrum.com. Soderstrum Funeral Home is assisting the family with arrangements. "Email Address" would like to share the life celebration of Arnold Stanley Ihle. Click on the "link" to go to share a favorite memory or leave a condolence message for the family.